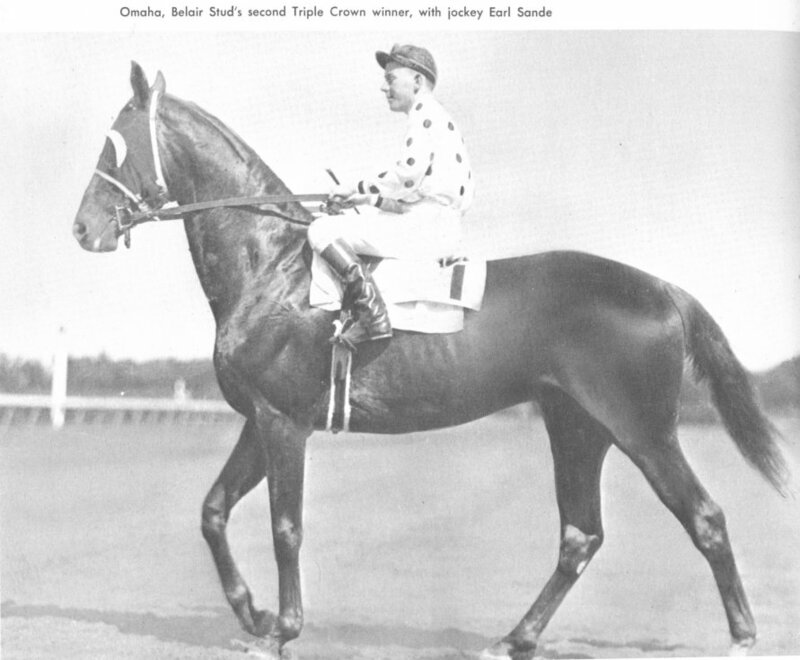 Although there have been many parent/offspring winners of individual triple crown races, there only one such duo has taken the entire triple crown: Gallant Fox and his son Omaha. Both horses were owned and bred by William Woodward’s Belair Stud and both carried his white with red dots silks. Gallant Fox was foaled in 1927, a trim bay with a crooked blaze, son of import Sir Gallahad III. As a juvenile (two-year-old) he was not stellar, but not bad, winning two of six starts, including stakes. His problem was not lack of speed or stamina but a plethora of curiosity (Drager 36). William Robertson described him as “lively as a puppy and just as inquisitive” (276). At the start of the Tremont Stakes, he was left at the barrier because he was too fascinated with watching the other horses. Things got much better at three. The year of Gallant Fox’s triple crown, the Preakness was run before the Dery, on May 9th. The colt went into the Preakness with a romp in the Wood Memorial. Even with bad racing luck, being boxed in and shoved back, Earl Sande found racing room for the colt, and after a tough duel with Crack Brigade, Gallant Fox pulled away for a three-quarter length victory. All this was a major coup for the colt who had “appeared to be so hopelessly lost on the first pass of the grandstand,” earning him his soubriquet “The Fox of Belair” (Drager 38-40). In the Derby, on May 17th, he came from behind in the pouring rain to win by two lengths (40). The Belmont, run on June 7th, matched him against juvenile star Whichone. Everyone expected a spectacular duel between the two; but when Whichone challenged in the stretch, Gallant Fox turned him back easily for a three-length win (43-44). From then on, there was little turning the Fox back, as he went on to win the Dwyer, Arlington Classic, Saratoga Cup, Lawrence Realization, and Jockey Club Gold Cup. There was one shocking comeuppance for the Fox at Saratoga. In the Travers Stakes, Gallant Fox and Whichone engaged in a suicidal speed duel on a muddy track, leaving the way open for a fresh long-shot named Jim Dandy to slip through on the rail and leave the two exhausted champs behind. Whichone broke down but did not have to be destroyed. One more race earning Saratoga the title “the graveyard of champions.” (Drager 45-47). Gallant Fox developed a cough and fever at the end of the season, so Woodward, feeling his colt had more than proved himself, retired him. Initially, the colt did well at stud, siring Omaha, Granville, and Flares––then, not so much. He died on 11/13/54, an hour before the runnings of the Gallant Fox Handicap and the Marguerite Stakes (named for his dam) (Drager 49). Omaha was a stunning beauty: “Bright gold chestnut, [with] a slash of a blaze” (Drager 51). His two-year-old season wasn’t exactly stellar, either, although he won or finished second in several stakes. He was just too big and awkward. However, at three he was no longer gangling but imposing, standing 16.2 hands tall (a hand equals four inches) (51-52). He took two races before the Derby, including the Wood Memorial (like his Dad), then took the Derby in muddy going by 1 1/2 lengths with a strong finish; the third time a father/son duo had done so. In the Preakness, Omaha earned the name “the Belair Bullet” when he “smothered his field” to win by six lengths! He failed to come home first in the Withers, but then shone in the Belmont on June 8th, coming from behind on a muddy track to out-duel Firethorn for a 1 1/2 length score (Drager 52-54, Robertson 310). Omaha’s post-triple crown career won him honor, as he took the Arlington Classic and the Dwyer (again following in Dad’s hoof prints), but came up lame prepping for the Travers and retired for the year. As a four-year-old, Omaha campaigned in England, winning the Victor Wild Stakes under 129 lbs. and the Queen’s Plate by a neck under 130. The filly Quashed nipped him at the wire in the Ascot Gold Cup, with him giving her weight; and the British took the colt to heart for his gameness (55-58). Woodward tried again for the Gold Cup the next year, but Omaha came up lame and was retired. Unfortunately, he did much worse at stud than his sire and was sent from Claiborne Farm to the Jockey Club’s Lookover Station in upstate New York, before he finished his days at ease on a farm in Omaha (how appropriate), Nebraska. He died in 1959 and was buried at the state’s premier racetrack, Ak-Sar-Ben (read it backwards) (58-59). Next installment: Man O’ War’s best son: War Admiral. Sources: The Most Glorious Crown (Marvin Drager); The History of Thoroughbred Racing in America (William H. P. Roberston). Gallant Fox photo from The Most Glorious Crown (Marvin Drager). 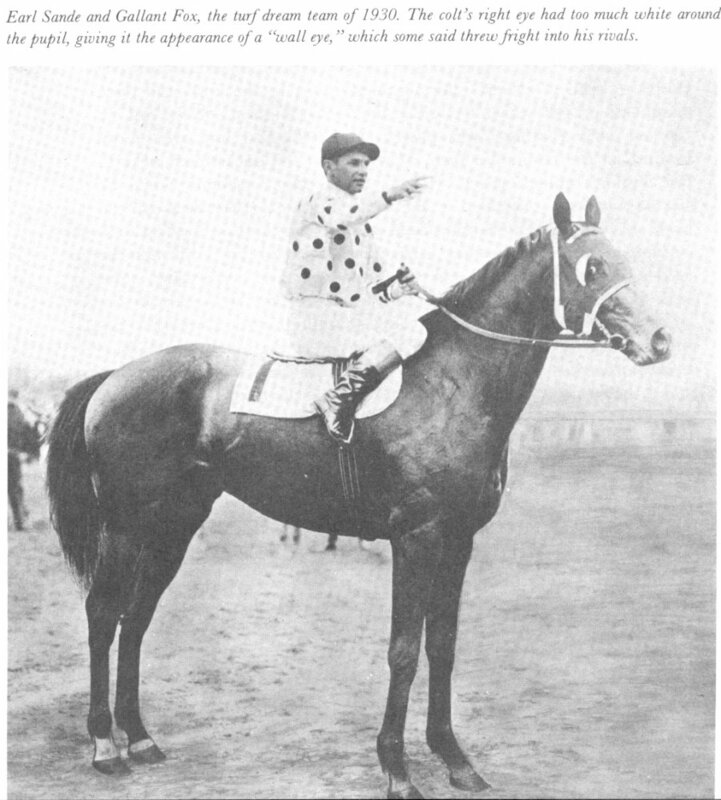 Omaha photo from he History of Thoroughbred Racing in America (William H. P. Roberston).